When my son asked if I could take in a homeless cat, I paused because I didn’t have familiarity with cats. In addition, she was pregnant. I had no idea what would be involved in looking after this animal and her perspective brood. I needn’t have worried. Mamma cat did everything right, giving birth and taking care of her seven kittens. Our reward for taking her in . 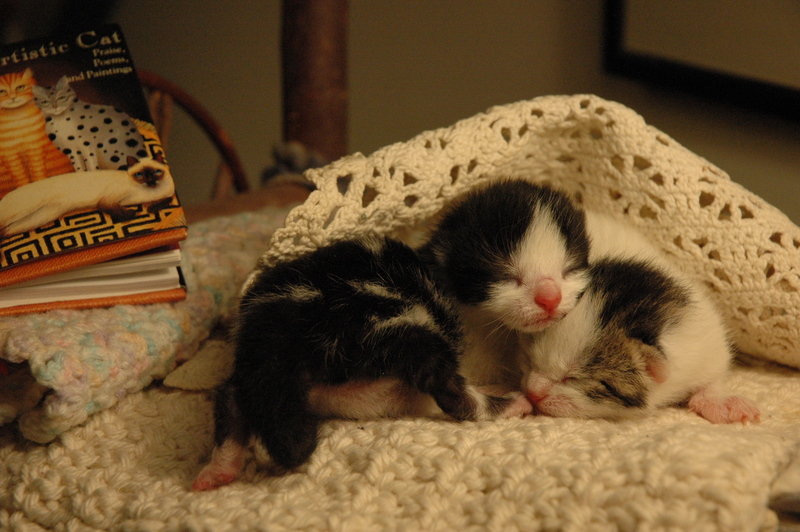 . .
We kept Momma cat and Sweetie Bumpkins (on the left), and we were lucky to find good homes for the other kittens. Congratulations for raising a son who cares about animals. Thanks for giving them a home. Very cute kitties. What I learned from having these cats is that they make us laugh, oh, that’s another reward. ; ) Thanks for commenting. Well, we took one cat in . . . the other seven were a bonus. What I liked best about your video: realizing that other cats do exactly what our cats do. A wonderful story of the power of love. How wonderful that you were able to find homes for all!! Thanks! I owe that to family members who pitched in to put out the call for homes. That is so sweet and kind of you. Kindness is the best reward. Ah, yes, you are so right. So CUTE! I have a friend who’s still trying to find folks to adopt her 6 cats. I think I’ll send out an email to my friends about it. Thanks for the reminder.